A young resident of the Tapis Vert internally displaced persons camp stacks rocks in an effort to build a foundation for a tent in the mud and sewage after overnight rains soaked the makeshift village. PORT-AU-PRINCE, Haiti - One of the heaviest rainfalls since Haiti's Jan. 12 earthquake swamped homeless camps Friday, sweeping screaming residents into eddies of water, overflowing latrines and panicking thousands. The overnight downpour sent water coursing down the slopes of a former golf course that now serves as a temporary home for about 45,000 people. There were no reports of deaths in the camp, a town-size maze of blue, orange and silver tarps located behind the country club used by the U.S. Army 82nd Airborne as a forward-operating base. But the deluge terrified families who just two months ago survived the collapse of their homes in the magnitude-7 earthquake and are now struggling to make do in tent-and-tarp camps that officials have repeatedly said must be relocated. "I was on one side (of the tarp), the children were on the other side and I was trying to push the water out," Jackquine Exama, a 34-year-old mother of seven, said through tears. "I'm not used to this," she said. Aid workers said people were swept screaming into eddies of water and flows ripped down tents an Israeli aid group is using to teach school. "They were crying. There was just fear down there. It was chaos," said Jim Wilson of the aid group Praecipio, who came running from his own shelter up the hill when he heard the screams. After the sun rose Friday, people used sticks and their bare hands to dig drainage ditches around their tarps and shanties. Marie Elba Sylvie, 50, could not decide whether it was worth repairing damage to her lean-to of scrap wood and plastic. "It could be fixed but when it rains again it will be the same problem," said the 50-year-old mother of four. 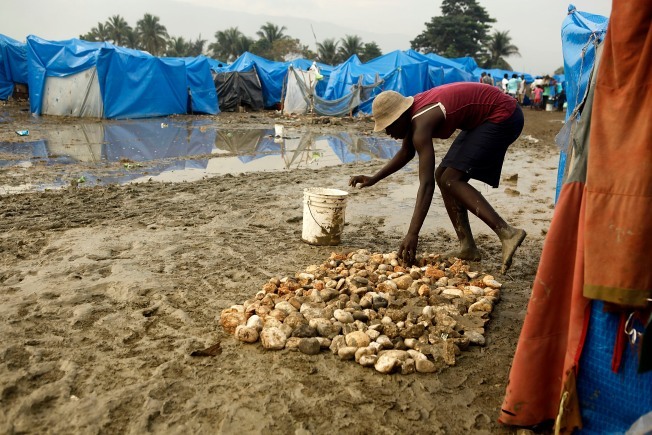 Standing water and mud also pervaded a tarp-and-tent city on the outskirts of Cite Soleil, several miles away. Residents waded through the shallow flood collecting their belongings. Officials know they must move many of the 1.3 million people displaced by the earthquake before the rainy season starts in earnest in April. U.N. Secretary-General Ban Ki-moon told reporters at the golf-course camp Sunday that the people living there were in particular danger. But after two months of searching and wrangling with landowners, the government has still not opened any of the five promised relocation sites that are better able to withstand rain and aftershocks on the capital's northeastern outskirts. Aid groups are also struggling to open their own camps. "It's been frustrating to us because we need to have those sites in order to build something ... better. Until we can do that people have no incentive to move," U.N. humanitarian chief John Holmes told The Associated Press during Ban's visit. "We're running out of time, honestly," Holmes said.